Police presence outside the Emirates Stadium prior to the match. ARSENAL’S EUROPA LEAGUE encounter with Cologne finally got underway an hour late on Thursday despite police making arrests after dealing with “disorder” at the Emirates Stadium as German fans occupied home sections of the ground. Thousands of ticketless supporters of German club Cologne arrived at the Emirates, while travelling supporters who did have tickets were unable to gain access to the ground for the Group H opener, with kick-off delayed by an hour in the interests of “crowd safety”. The match did begin at its rescheduled time of 9:05pm local time (2005 GMT), having been pushed back an hour from its original 8:05pm (1905 GMT) start. Cologne fans, who had been singing before kick-off, had even more reason to celebrate when Jhon (attn eds: correct) Cordoba’s 40-yard strike gave the visitors a ninth-minute lead. 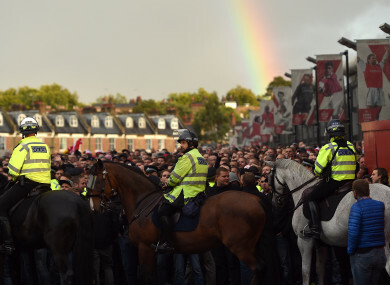 “Officers are dealing with disorder at the Emirates Stadium where fans have gathered for the Arsenal vs FC Koln match,” said a pre-match statement issued by London’s Metropolitan Police. A subsequent statement confirmed arrests had taken place. Arrests at 2141hrs (2041 GMT) = four people have been arrested on suspicion of public order offences,” Scotland Yard said. Earlier reports suggested as many as 20,000 Cologne fans had gathered in London just hours before Thursday’s kick-off despite only 3,000 tickets being made available to away supporters. Meanwhile Arsenal issued a statement on their website warning travelling fans they risked being kicked out of the ground if they bought tickets in the sections of the Emirates reserved for home supporters. Please note visiting supporters that purchase a ticket in the home end for this fixture are likely to be ejected from the stadium,” the statement said. Cologne are currently bottom of the Bundesliga table, having lost all three of their opening games in this season’s German top flight. Email “Arrests made as Arsenal-Cologne kicks off despite crowd trouble”. Feedback on “Arrests made as Arsenal-Cologne kicks off despite crowd trouble”.